I know, I’ve been flagging on the writing/commenting/replying end of things (which is a total shame, because that’s the part of blogging I love best). In between teaching, prepping for my Part II exam (more on that in a sec), and some really exciting new developments in the cooking/baking part of my life, I’ve been catching about 4 hours of shuteye a night…when I’m lucky and don’t get insomnia. So to perk things up around here, I thought I’d take a big break from everything else, share some of the BEST colorful cookies I know (seriously, I served these at my ice cream cookie sandwich party a few weeks ago and they were ALL GONE), and sit down for a little life chat with all of you. Got your tea or coffee? Good. 1. First parcel of big news, which you might have read about on Sunday’s post, but anyway: guys, I’m competing in this year’s annual California Strawberry Festival Berry Blast-Off competition! After an hour of intensive cooking in a professional kitchen last week, the judges picked my original Steamed Strawberry Coconut Poke Cake as one of two entries for the final showdown. This will be my first time on a live stage (eep!) cooking (eep!) in front of hundreds of people (EEP!) with a microphone and cameras trained on me as I try to keep my hands steady enough to crack an egg like a normal person which I cannot for the life of me do (okay, where’s my fainting couch?). We’ll be traveling to Oxnard that morning so if you’re in the area, you might want to stop by the Strawberry Promenade at 1 PM! You can read more press releases about the competition here and here. Wish me luck! 2. Part II Exams are quickly descending on me as June 8th creeps steadily closer and breathes down my neck like the drunk vampire I imagine would lurk at a dingy sports bar on a Thursday night. Without going into all the boring details, I am currently writing my dissertation proposal, which is ~50 pages of research + literature review + analysis-pretending-to-know-what-it’s-talking-about. In the exam, I’ll get to sit down with my panel of four professors and basically not sound stupid about my chosen topic. I’m more than halfway along but am on a SERIOUS time crunch–hence, the late-night freak-out/no-sleep sessions. So in keeping with the trend: wish me luck! 3.Did I mention that #2 is giving me serious anxiety and stress issues? 4. With the promise of constant sunshine, I’m swimming again on a near-daily basis. Apparently, all of my friends are aware of this fact regardless of whether I tell them so or not, because my raccoon-eyed goggle tan is officially back in full bloom. 6. Two weeks ago, I was hit on the back of the head hard with a Frisbee at about a 7-foot range. I’m fine now–the ear-ringing stopped after a day and the headache went away over the weekend–but I’ve lost my appetite and have woken up dry heaving two or three times in the middle of the night. Also, a few of my right toes feel slightly numb, though there’s still feeling in them. I think it’s the stress (seriously), but it doesn’t help that I’m paranoid about dying of Frisbee attack-related injuries and my friends/family aren’t. Any thoughts from anyone who’s been clobbered on the noggin? 7. Last week I posted the following status. Tonight at Trader Joe’s: I met a cashier who asked every person in front of me how they were doing, and everyone would mutter a reply without bothering to actually talk to him. Finally, when I got to the register, he asked me how I was doing. Even though it’s been a pretty crappy past week in terms of personal stuff, I smiled and told him it had been a really great day–which it had. When I followed up by asking him if he was in for a long night, he said that he actually was--not because of work, but because of rough stuff happening in his private life. Then suddenly his whole tired face lit up and he added: “But your smile made my night. 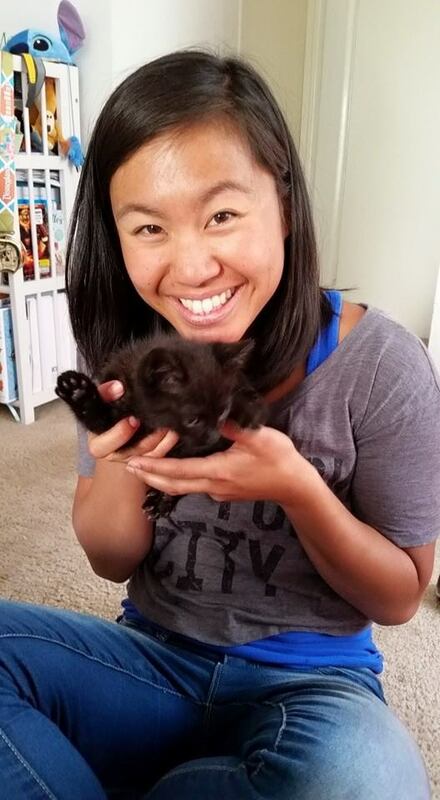 Thank you so much for smiling and asking–it just made things seem a lot less tough tonight.” Always smile for others when you can–you never know for whom it will be the only ray of sunshine they see all day. I sat up thinking about life for the rest of the night. 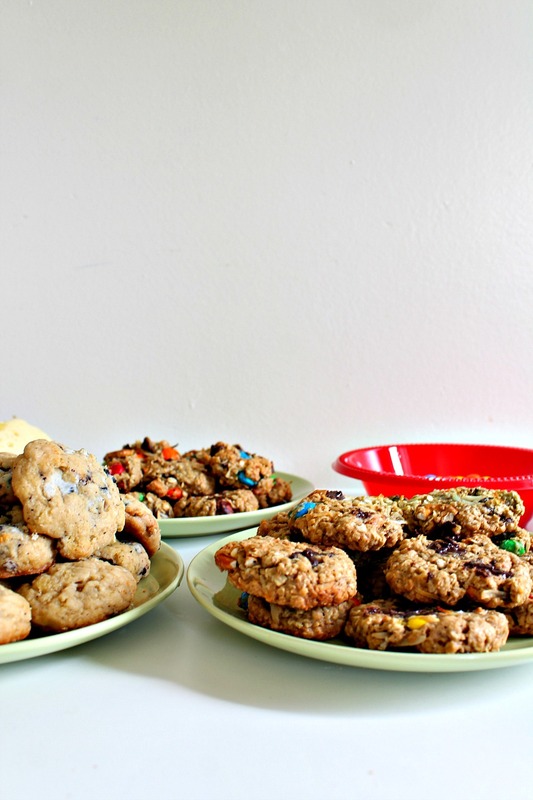 But what about these Loaded Oatmeal Monster Cookies you promised?! you’re probably asking right about now as you reach the bottom of this relentless shpeil. Never fear! Grad student rant #done. This cookie was one of the highlights of that ice cream cookie sandwich party I told you about, because a) the fact that everyone loved them made me feel like a supahstarrrr, b) they brought all my wonderful friends over to my place in an absurdly fun gathering, and c) they are damn good. I took one of my favorite oatmeal cookie bases and loaded it with everything in my pantry: chocolate chips, shredded coconut, M&M’s, and pretzels (WHATEVER YOU DO, DON’T LEAVE OUT THE PRETZELS). Sweet and crunchy and soft and salty all at once: if my week hadn’t gotten better right when it had, you can be damn well sure I would’ve made these cookies again to perk things up a bit! Go ahead–fill your life with color! What has been the highlight of your week so far? 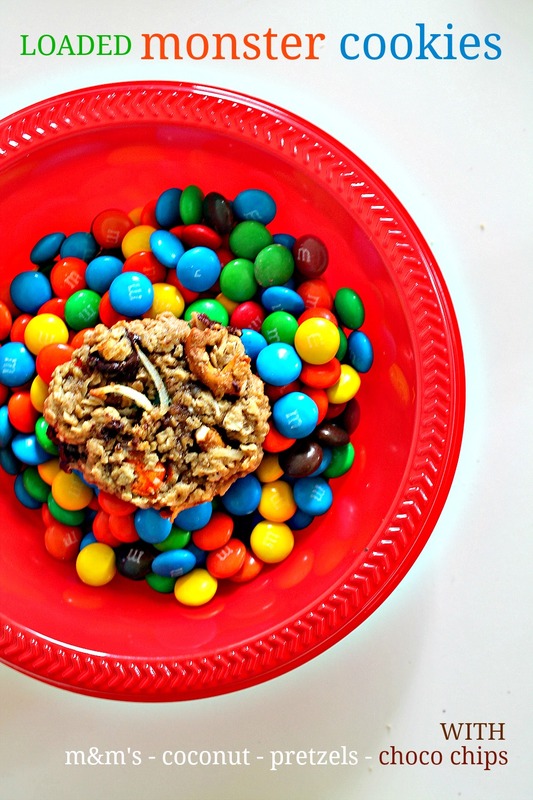 These Loaded Oatmeal Monster Cookies were the HIT at our latest ice cream cookie sandwich party! 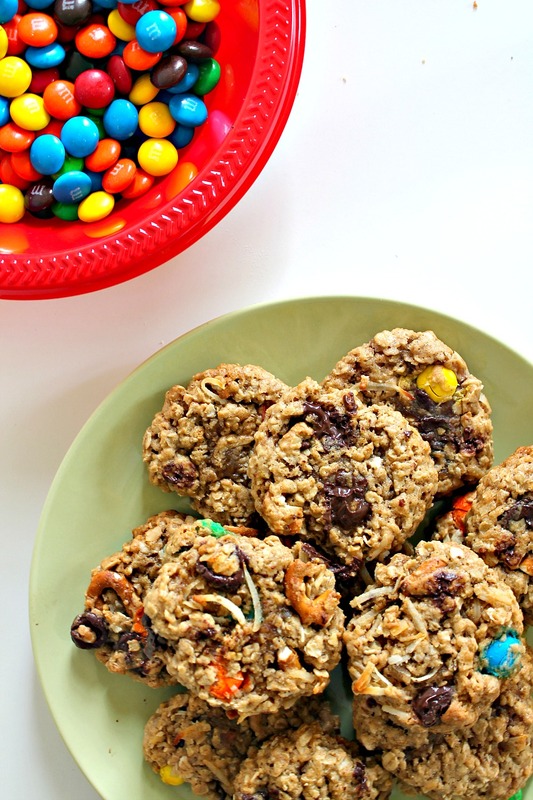 With a soft but slightly crunchy oatmeal cookie base, these salty-sweet cookies are loaded with coconut, M&Ms, chocolate chips, and pretzels. Swap out mix-ins for some of your own! Oatmeal cookie recipe slightly adapted from Sally's Baking Addiction. In a large mixing bowl, cream together butter and both sugars until light and fluffy. Mix in egg, vanilla, and molasses until combined. Add flour, baking soda, ground cinnamon, and salt. Fold into wet ingredients until dry ingredients have been just incorporated. Fold in oats, then fold in remaining mix-ins (chocolate chips, M&Ms, coconut, and pretzels,or other mix-ins as desired). Chill in refrigerator for at least 1 hour (or in freezer for 30 minutes). Using a small to medium cookie scoop (or a spoon), scoop out 1-inch balls of dough and place 2 inches apart on prepared cookie sheet. Bake in preheated oven for 10-13 minutes, until the edges have set but the centers still look slightly undone. Remove from oven and allow to continue "cooking" on the cookie sheet--the heat from the sheet will allow the cookies to "set" but remain soft! Wow, I needed two cups of coffee to read that. 🙂 Congrats on all the loads of good stuff going on in your life. On that Frisbee thing, my medical knowledge is zero, but those symptoms sound a touch like a fractured skull. Hard to believe a Frisbee could do that, though. But you might want to have a trained professional check you out. Anyway, good post — thanks. Wow, thanks for the tip! I may want to get it checked out after all… You’re definitely confirming something that has been nagging me for the past week. Well, fingers crossed! Thanks for your comment, as always – hope you’re having a wonderful week! THANK you so much, Andrea! That’s positively sweet of you – goodness knows I could use your lovely presence 🙂 still, I’ll keep you in mind on the big day! I totally appreciate your kind words; they made me feel a lot better and helped put things back in perspective, which I need. Hope you’re having a wonderful week! I got so excited with all your updates that I forgot to say your monster cookies look so amazing. It’s loaded with all my favorite ingredients! First – YIPPPPPPPEEEEEEEEEE AND CONGRATS!!!!!!!!!!!!!!!! 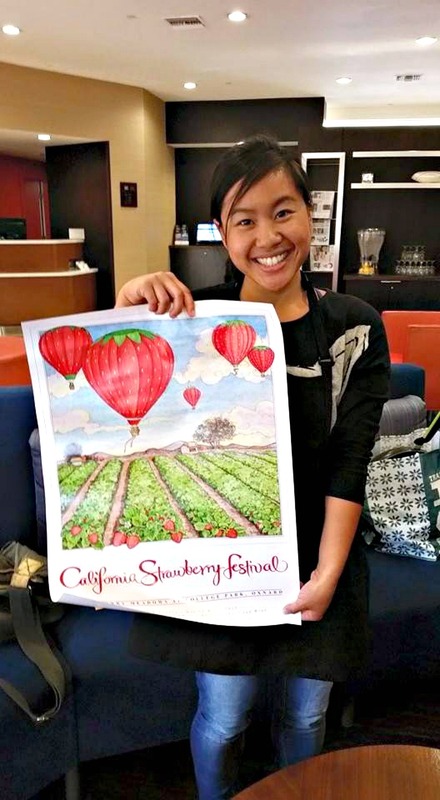 I am so so excited to hear that you got picked to participate in The California Strawberry Festival Berry Blast-Off competition! I wish I could watch it – is it gonna be on National TV? I wish you all the best, Ala! Just stay away from frisbee parks ok! You are so right about the healing qualities of a smile – and what a sweet cashier to tell you how much your smile meant! Good luck on your exams dear – and WOA -these cookies sounds so scrumptious! Oh wow THANK YOU, Shashi!!!! You’re seriously amazing–if only it was national! I’m pretty sure it’s going to be very, very local haha. But thank you!!! xo take care! CONGRATULATIONS!!! Fingers crossed that you will be the grand prize winner at the strawberry festival!!! I love your news packed posts—so much fun stuff going on in your life. And you are just adorable in case you didn’t know! Anyway, I made monster cookies last week and am having trouble limiting myself to just one. Well, I failed tonight. And I wish I had added coconut to mine—yum!!! Ahhh I love this post!! So many amazing things going on for you. SO so happy!! First of all…u are going to rock that exam. I remember how much stress the qualifying exam caused me in my third year but it’s really not that bad. You will rock it!! Also, good luck with the contest. I love strawberry season and so excited for you!! while i hate to be a worrywart at the same time i have to say that i’m a bit concerned about your symptoms. I have to agree with kitchenriff and wonder if it might not be something more serious than stress. not that that isn’t serious but potential head injury/fracture really should be checked out. Please do follow-up and let us know how it goes. and best of luck w/ your upcoming exam. Having recently finished a comprehensive exam myself i know how stressful it can be. Jacquie, that means a lot–no worries, you’re not a worrywart! I was chatting to my friend last night and he convinced me to go later today–along with your comment, I’m really going to make sure I get this checked out. Thanks so much for your kind words–I had been hearing so many “you don’t need to go, you’re fine”‘s this week that I was feeling super conflicted, so I really appreciate your affirmation. I’ll keep you guys updated! In biology we don’t have a grad school exam like this…and I am SO glad about that!! Good luck chica!! Gahhh, that’s good to hear that you don’t have to go through it! Still, I bet bio programs are just as nerve-wracking and demanding! But THANK you, fingers crossed, Joanne!! Ala, have you gone to the doctor for that head injury?!!!! I’m not joking! head injuries are no joke and your symptoms sound scary!!! go to the doctor, please!!!!!!! please let me know that you saw this comment!!!! and I loved the TJ’s story. . YES!!! We are human. . let’s always be kind and recognize and acknowledge each other. . for the love of GOD! Which sooo much going on in your life, I am more than pleased that you had time to share these fabulous cookies! The hint of molasses is a perfect match with the oats! Good luck on your exams and the strawberry festival! Oh my goodness, that frisbee attack sounded pretty serious. Hopefully you can get it checked out. Sorry about your stressful May, so nice to hear that you made someone else’s day at TJ’s though. Love these monster cookies! They look insanely delicious!